Of all the special projects the Department of Aviation has been part of, this is the one that makes me “happy”. 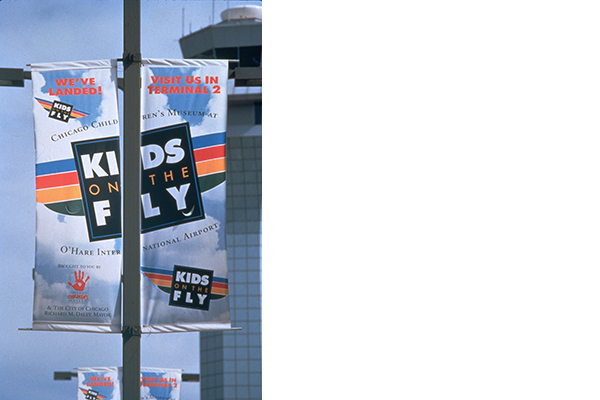 The Kids On The Fly exhibit is designed to celebrate air travel, presenting young travelers with a hands-on playful introduction to aviation. Beyond its appeal as a welcome relief from airport delays and stopovers, the satellite is envisioned as a cultural amenity that enhances and encourages use of one of the world’s busiest airport. 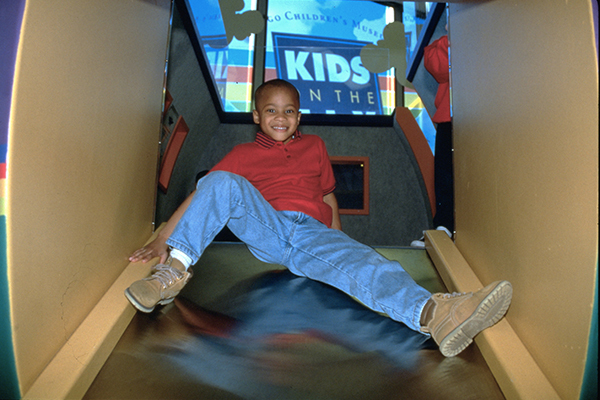 The program calls for a dynamic, safe and secure environment to replicate the quality and mission of the main children’s museum, setting a new standard for stand-alone exhibits. Located within a very active terminal, the exhibit is sited to make visitors feel as if they are on the runway itself. 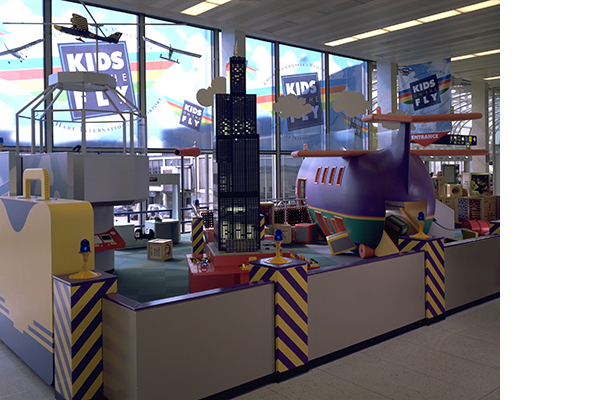 A variety of multi-sensory experiences were created, from loading freight to monitoring the real goings-on at O’Hare via electronic elements in the simulated control tower. 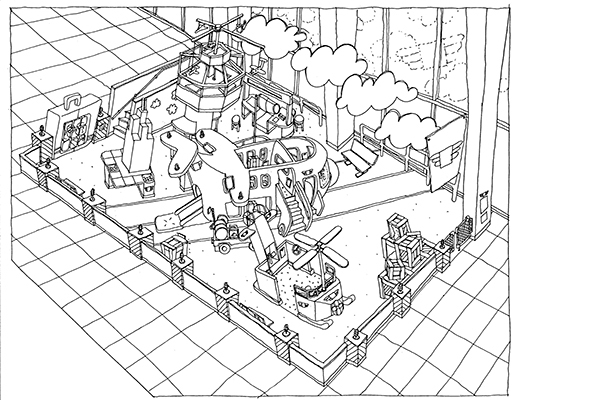 An interactive activity center was developed in collaboration with aviation staff. Under the shadow of a giant Lego™ Sears Tower, children rebuild and plan Chicago’s downtown using constructive blocks. Focusing on universal appeal and accessibility as important design criteria, this environment allows visitors of all ages and abilities the freedom to control their experiences. 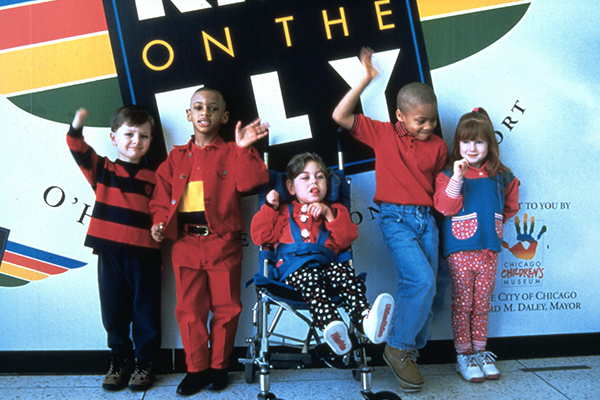 At Kids On The Fly, the most interesting way to enter the cargo plane is via the colorful, activity-filled incline. Instead of treating the ramp in a subordinate architectural manner, it is celebrated as the primary entry and as a source of play. 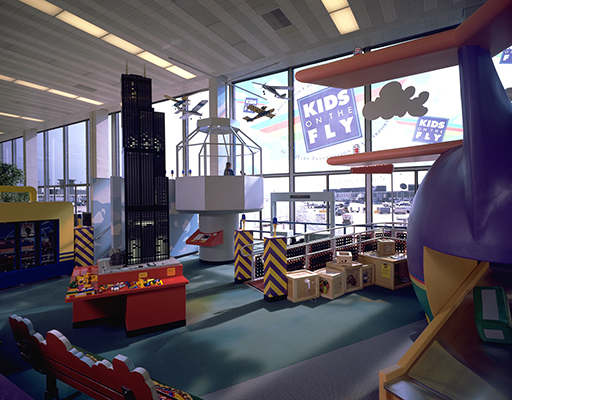 Children enter the raised cockpit, pilot the plane, listen to recordings of air traffic control, and have a great view of real take-offs and landings. I do want to thank you and all of the members of the design and museum teams for all of your tireless efforts in meeting all of the very special requirements that are set forth in doing work at the airport. ~ Robert E. Woodworth Jr., AIA, Director of Architecture, City of Chicago. Distinguished Building Award, American Institute of Architects, Chicago Chapter, 1997. Recognition of interior accessible exhibit located in a public domain.